Just over a week away from the launch of its return to Uganda has the Gulf Air team now gotten into gear and is working the market with launch fares. While travel to the GCC region, mainly thought to be Dubai of course, and some key destinations in India, is pegged at 200 US Dollars return, PLUS taxes, it is double of the recent launch fares by Qatar Airways which for the launch week were on offer at 99 US Dollars for Gulf destinations, and while this particular offer has since expired, market fares will surely reflect the entry of the latest airline into the Uganda market and the subsequently sharply increased competition. 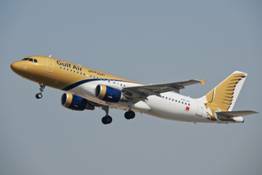 Gulf Air will re-enter the Ugandan market with 4 flights a week on the 05th December and their choice of GSA, Lets Go Travel Uganda / UniGlobe ensures that they will leave no stone unturned to work the market hard. Happy landings, as and when, and watch this space for the inaugural flight report.